We recently covered a new update in how Google displays search results. Now, there is a new Google Chrome extension from Yelp calling for business owners’ attention. Yelp is one of the most influential listing sites out there and with this Google Chrome Extension they may become all that more influential. The extension can cut consumers search times down considerably. Yelpify was created by Raj Nagasubramanian and won first place winner at the Yelp online hackathon. What Nagasubramanian created was a way for local business’s Yelp ratings to appear on search sites other than Yelp. 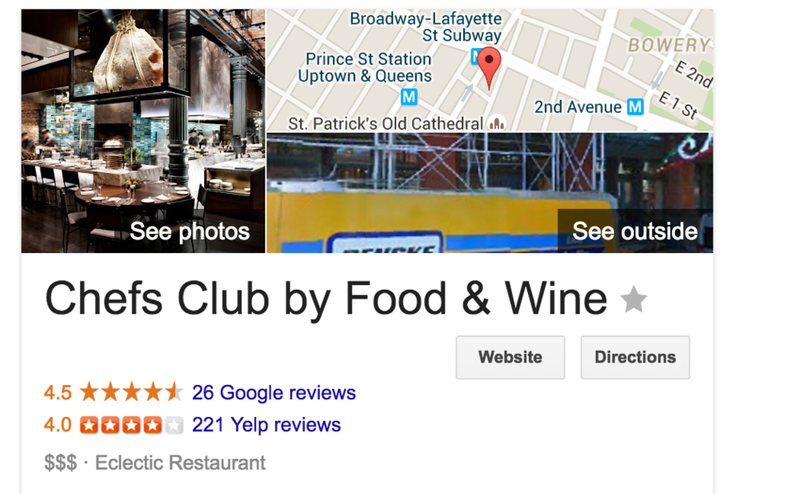 For example if you search for “Chef’s Club NYC” on Google, I would be able to see their 4.5 star review on Google as well as their 4 star Yelp rating right below the Google rating. This information saves searchers time and enhances the general Google listing. Searchers will also see a link that takes them right to the business’s Yelp page. In addition to the Yelp ratings appearing on Google, the Yelpify extension can appear on other sites like OpenTable, TripAdvisor and GrubHub. The extension is a way for Chrome users to simplify their searches and find more information in one place. As many business owners know, yelp and similar review sites have changed the way that consumers search for businesses. Business owners should make sure that they are setting aside time to monitor their Yelp reviews and ratings more since these reviews will be appearing in more places. If you want more help in getting the most out of your online listings, check out how SinglePlatform can help you local business stand out everywhere that matters online.